Price: $199.00 - FREE TO MEMBERS! For many years, owners and general contractors have looked for cost-effective alternatives to the traditional payment/performance surety bonds, three-way agreements in which a surety guarantees to one party the performance and/or payment of another party. A new subcontractor default insurance (SDI) product, issued by Zurich Insurance under the name of Subguard, has emerged as a viable alternative that protects an owner and general contractor from the consequences of a defaulting subcontractor while eliminating many of the delays and other problems associated with traditional surety bonds. 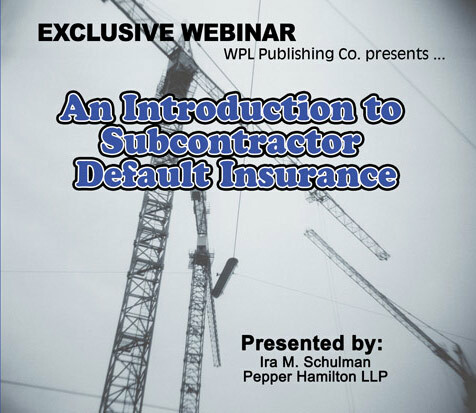 This interactive program will provide you with a firm understanding of subcontractor default insurance, including coverage parameters, exclusions, and other important information. Understand what subcontractor default insurance covers and what is excluded. Compare subcontractor default insurance to traditional surety bonds. Identify the pros and cons of subcontractor default insurance. Estimate the costs involved and evaluate whether it is worth pursuing for this new insurance product. This program will be of interest to owners, general contractors, subcontractors, attorneys and surety professionals. Ira M. Schulman is a partner in the Construction Practice Group of Pepper Hamilton LLP, resident in the New York office. He has over 30 years of experience in all aspects of construction law with an emphasis on all forms of dispute resolution and contract negotiation. Primarily representing public and private owners, as well as contractors, subcontractors, sureties and school districts, he has tried numerous complex construction disputes in jury and bench trials in state and federal courts and before arbitration panels. He also has participated in many mediations and has successfully represented clients with construction contract award issues before various city agencies. Additionally, Mr. Schulman has an active transactional practice and is regularly called upon by owners and contractors to draft construction contracts and agreements.